La la la la la la la LA LAAAAAAAAAH. La la la la la la la. LA. LA. LAAAAAAHHHHHHH. Sing along with me, the Rhubarb Kimchi Song. As Plum Kimchi heralded autumn, Rhubarb Kimchi will greet the spring. La La lalalalalalahhhh. I pulled some stalks from a perennial bed I’d made last year. Everything’s come up again, which is satisfying for a not-great gardener like me. Removed the poisonous leaves, and sliced the pink stalks. And added some sea salt, some orange zest, and juice of that orange. And some spring onions. And massaged the mix with a paste of chilli powder, garlic, ginger, onion seeds (kalonji/ nigella), and a little sugar. 3 generous tablespoons hot pepper powder, Korean the best! Mush down in a crock or jar and so that liquid rises to the top. Keep the jar on a saucer in case it overflows. Keep in a cool place, and eat in a few days, or store in a very cool place when fully fermented. La la lalalalala laaaaaahhhhhh— it’s tangy and sour and spicy right away, and every half hour interval you can wait for a nibble, it gets better and better. New heights for rhubarb, and for kimchi, two joy-producing foods indeed. 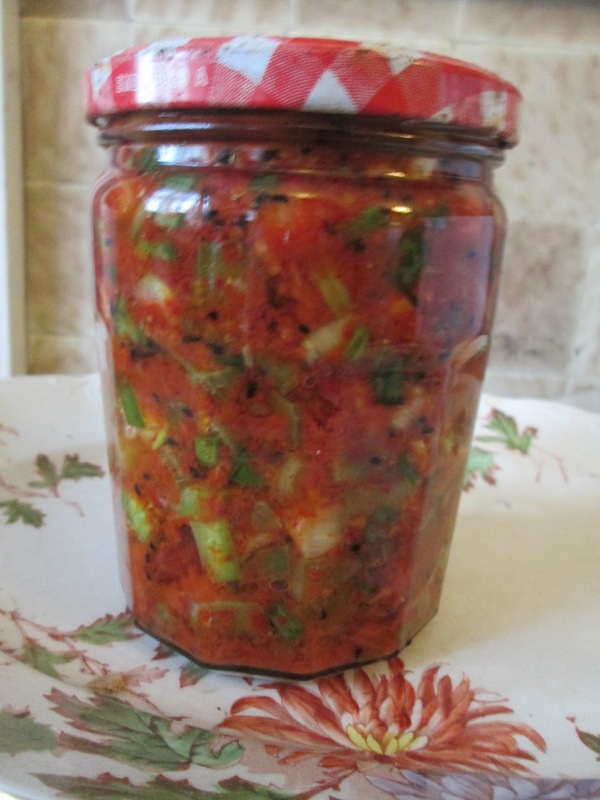 PS– I must cite yesterday’s perusal of this wonderful Indian rhubarb aachar-style pickle as an inspiration. Can’t wait to try this as my next Rhubarb Reverie. Pure genius!! I am so making this. P.S. Where do you get your Korean hot pepper powder? Thanks. Hello. The Korean hot pepper powder, from an Asian grocery in a city, but other chilli powder would work– just the Korean stuff has a brightness and beautiful colour too. You could grind dried chills? Or am thinking fresh chilli peppers would be delicious too! My rhubarb is not quite up yet, but will get around to this when it does. Fab post! Brilliant! I never know what to do with rhubarb as I don’t like all the sweetness it usually requires. This is the answer! I never know what to do with rhubarb (don’t like all the sweetness needed to make it palatable) so this is a welcome recipe from Annie Levy’s Kitchen Counter Culture blog. Rhubarb grows plentifully now in the ‘hungry gap’ when the UK’s productivity of fresh produce is at its lowest. Since Annie Levy introduced me to kimchi via a jar of plum kimchi sent by post, I make it regularly . This Korean condiment combines two fine attributes: zingy-taste and digestion-soother. 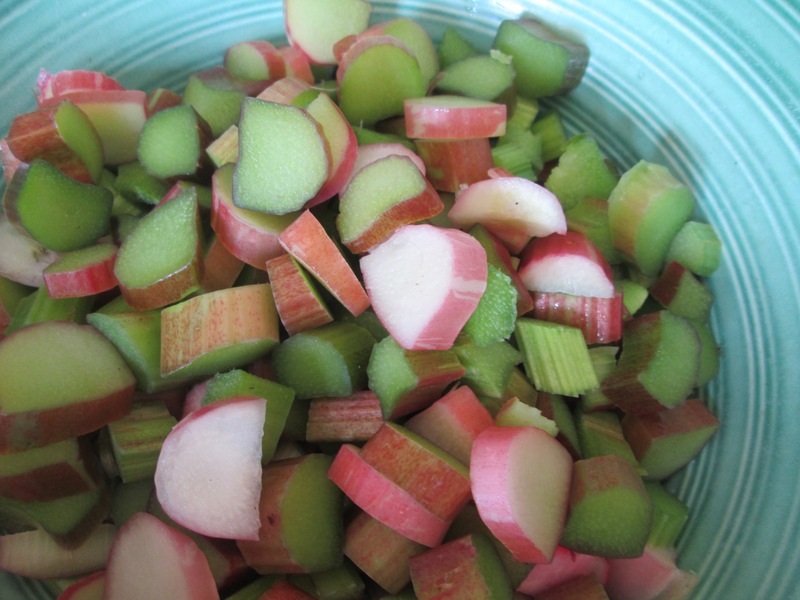 Now with rhubarb, a third quality can be added: super-seasonal. Rhubarb kimchi is the answer! Really Unique Recipe. Never thought the combination! 😉 Thanks for sharing! we also have plenty of rhubarb in the garden. I might give this a go! If one where so weird as to not like spicy (as in “hot”) food, would sweet paprica be an appropriate substitute for the chili? I like that idea. There are versions of chili that are not hot. The custom of fermenting veg in this way predates the arrival of chilis in Korea. I would say always feel free to experiment and please yourself! Did it bubble lots mine smells great but not bubbling. Can I make this with frozen Rhubarb. Have a freezer full from my garden, love that this recipe doesn’t use tons of sugar! Why not make a small amount and try? I am so happy to hear! Thank you for saying so.